Correct caster & camber in your lowered 2015-2019 Mustang with Maximum Motorsports caster camber plates. Correct the suspension geometry on your lowered S550 with this 2015-2019 Mustang Maximum Motorsports caster camber plate kit! Lowering your S550 Mustang will cause the top of the front tires to "lean in" towards the center of the car, resulting in rapid and/or uneven tire wear. Maximum Motorsports caster camber plates provide the means to properly align your Mustang's front tires. Especially well-suited for lowered Mustangs, Maximum Motorsport's innovative design provides the ability to adjust the camber setting of your Mustang's front tires. Even a Mustang that is lowered as much as 2.5 inches can still be aligned to factory specifications. Pick up a set of Maximum Motorsports caster camber plates today! 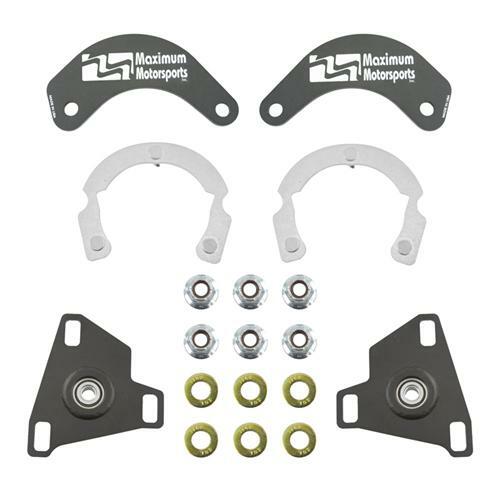 Maximum Motorsports is known for their exceptional quality and it shows in this caster camber plate kit. Each main plate is precision laser-cut from a very high-grade alloy steel. This new alloy has a yield strength of 100ksi, 2.8 times the 36ksi yield strength of mild steel, and 1.6 times the 63ksi of normalized 4130 alloy. This same alloy is used by Ford. All steel components are either Zinc-plated or powder coated for improved styling and corrosion protection. MM designed a PTFE-Lined spherical bearing that is custom manufactured in the USA. This bearing provides proper articulation, unlike urethane-based plates. Installation of these plates provides you with 1.75 degrees of both positive, and negative, adjustment! All installation hardware is included for a quick and easy installation. This kit retains the use of your factory strut dust covers. 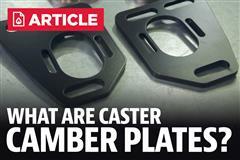 What Are Mustang Caster Camber Plates & What Do They Do? 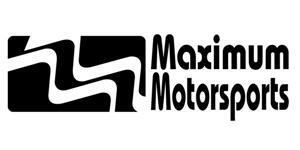 Maximum Motorsports Mustang Caster Camber Plates. Finally got your hands on your S550 Mustang? Ready to git rid of that fender gap? If so, don't forget to pick up a set of 2015-2018 Maximum Motorsports caster camber plates. Lowering your S550 Mustang will cause the top of the front tires to "lean in" towards the center of the car, resulting in rapid and/or uneven tire wear. Maximum Motorsports Caster Camber Plates provide the means to properly align your Mustang's front tires. Especially well-suited for lowered Mustangs, Maximum Motorsport's innovative design provides the ability to adjust the camber setting of your Mustang's front tires. Even a Mustang that is lowered as much as 2.5 inches can still be aligned to factory specifications. 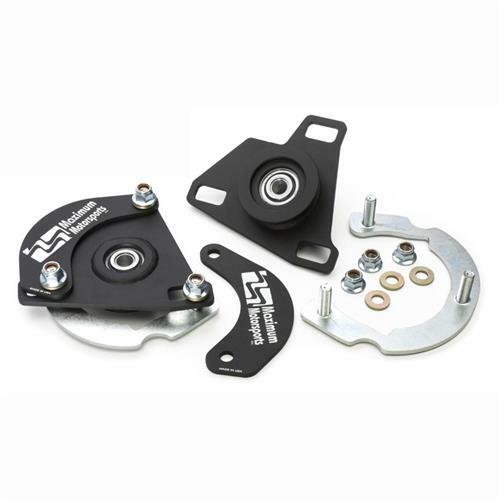 Pick up a set of Maximum Motorsports caster camber plates today! Construction Of The Mustang Caster Camber Plates. Main plate is laser-cut from a newly-available very high-grade alloy steel, not mild steel. The increased strength of this high-strength steel greatly reduces the possibility of bending. The Maximum Motorsport spherical bearing is designed and custom made in the USA. - 1.75-degrees continuous range of camber adjustment. - PTFE lined spherical bearing was designed by MM, and is custom manufactured in the USA. Spherical bearing allows proper articulation, unlike urethane-bushed camber plates. - Retains stock strut dust covers. - Steel components are either zinc plated or powder coated for great looks and long lasting protection. - Main plate is precision laser-cut from a very high-grade alloy steel. This new alloy has a yield strength of 100ksi, 2.8 times the 36ksi yield strength of mild steel, and 1.6 times the 63ksi of normalized 4130 alloy. This same alloy is used by Ford and other OEMs.